This past Thursday night while I was attempting to do some online homework my boyfriend, BD was in charge of cooking dinner. BD and I have been dating for about three years now and one of the few things that we are equally passionate about is good food. My mother was always a great cook and while she never sat down and taught me, I am pretty sure I inherited my skill and knack for cooking from her. Not sure where I get my baking ability though b/c Mom can't even bake frozen garlic bread without burning it! In past relationships I was always the one that did all of the cooking (unless you count making PB&J or ordering take out - I don't). This was until I met BD. I know he comes from a long line of southern cooks and that certainly does show but a majority of his skill was gained from cooking in restaurants. He's been a Sous Chef at a major Italian restaurant, worked in countless other acclaimed local places and is currently moonlighting at a local Seafood House as a Saute Chef. He's a fantastic cook and definitely the "professional" of the two of us. This tends to lead to problems from time to time in the kitchen but we are working on it. So this past Thursday BD had full range of "my" kitchen. He asked what I was in the mood for and since we had a lobster in the fridge, I simply said Lobster Pasta - something yummy. He popped online for a little inspiration and the following dish is what he whipped up. This is actually pretty typical for both of us to do. We get a craving or an idea and just wing it. Usually it works and I think he hit this one out of the park. Because we don't follow recipes 99% of the time I know this will present a challenge when trying to share here but I'll work on it. Below is the recipe courtesy of BD. I can't promise if its exact but its probably pretty close so feel free to make some adjustments to your own taste. - Boil water for linguine first so it can cook while you are working on the dish. When it is cooked al dente, set aside in an ice bath to stop the cooking process and then strain and set aside. - In a large saute pan, saute shallots and garlic in one tablespoon of butter until shallots are translucent. 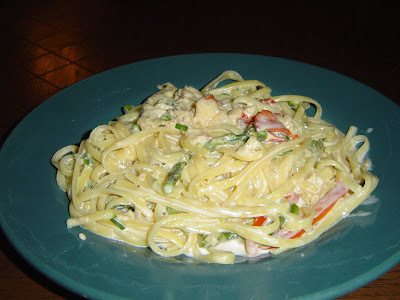 - Add asparagus and lobster with a splash of water and the remaining two tablespoons of butter. Let lobster simmer in the butter and cognac for about a minute and then remove and set aside. - Turn burner on high and add heavy cream and let cream reduce by 1/3. Be sure to stir frequently. - Once cream reduces, stir in Parmesan cheese and let simmer on low until it thickens. - Add lobster and add salt and pepper to taste. Let simmer for another minute. - Add pasta to saute pan and toss to coat evenly. * You can toss the tomatoes and chives in at this point OR place on top of each dish after plated for presentation. We did the former. My thoughts on this dish: I really liked it. The plate pictured is mine and I ate the entire plate. The asparagus and lobster worked really well together and I thought the tomatoes and scallions added a nice bit of freshness to the dish. The cognac flavor wasn't overpowering at all which was great and instead it played nicely in the background. My only complaint was that I didn't have a good hunk of crusty bread to mop up all the lingering sauce on my plate. BD says he was surprised how well this turned out and we will definitely be making it again. Enjoy! And feel free to write if you need some claification. And please excuse my noob picture taking skills - I'll be sure to work on that too! I read this article several days ago but haven't had a chance to write about it yet. For starters: I am a HUGE fan of Milk. My parents raised my sister and I to have milk with every meal. To this day when I'm at home having dinner it is STILL my preferred beverage of choice. For some reason, nothing else seems to satisfy my thirst during dinner quite like milk can. Personally, I prefer 2%. I can drink whole and I can drink 1% just fine but skim milk might as well be water to me. This blog is going to be an inspiration and a challenge. I've toyed with the idea of blogging for quite a while now but have really lacked the focus, time and ambition to do so. Not to mention I was trying to figure out WHAT I would exactly blog about. Maybe Love? Who wants to hear me whine all day? Money? Yea, right. My writing? I'm not THAT ready for open criticism. So I have turned to one of the things that I probably enjoy way more than I should - FOOD. (Like the blogosphere needs another food blog!) I love all things food. I'm a huge foodie but probably not a Food Snob. I love the "dark" side of food too much. So I think the bulk of this blog will be recipe focused. Why? Because I love to cook and its one of the few things I will admit to being good at. I also plan on having other types of posts but we'll see how it all fleshes itself out.